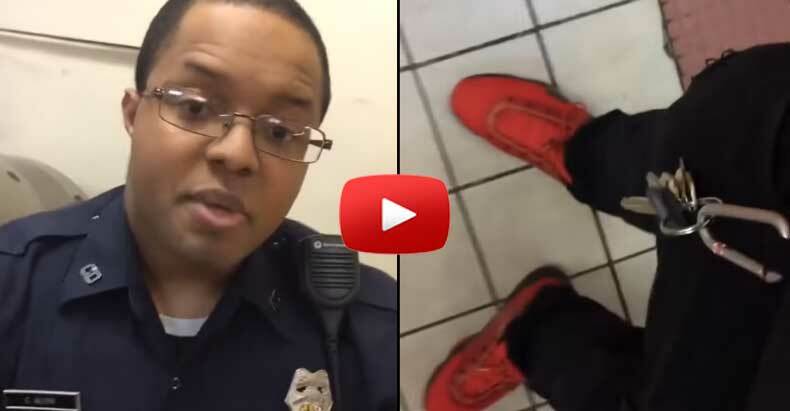 Baltimore, MD — A ridiculous video was uploaded to Youtube this week showing a Baltimore cop stop a man for his choice of clothing. The cop’s hunch allowed him to detain the man, take his identification, run a search for warrants, and issue a citizen contact sheet. “You are receiving a citizen contact sheet based on some of the gang activity that is going on around here,” says the officer in the beginning of the video. At this point, the man knows he has no warrants and has not committed a crime, so he proceeds to make the officer look ridiculous. “You have on glasses, are you in the ‘glasses gang’?” asks the man, highlighting the downright silly nature of the stop. For his choice of attire, this man was stopped by the police, detained, and his name entered into a database. For the rest of his life, this man’s name will be in a database for suspected gang activity; and all he did was choose to wear red. Even if this man was in a gang, as the Free Thought Project pointed out last year, Baltimore gangs actually stopped looting during the Freddie Grey riots. Members of the Crips, Bloods and BGF, Baltimore’s three largest gangs, even stood with city council members during a press conference last year. The council members spoke very highly of the gang members and their recent efforts.“These men have been out on the street quelling the senseless violence that has consumed our city. After meeting with them today it is clear that the notion they were planning on harming our police officers is false and simply deterred the resources we needed to focus on the individuals who instigated these riots. I applaud these young men for standing here and speaking out for our city.” City Council President Bernard C. Young said. The gang members were even out in the streets directing traffic. So much for stereotypes.